This is a repost from Chris Pearce’s blog. Recently I landed support for the HTML5 video ‘buffered’ property in Firefox. This is cool because we can now accurately determine which time-segments of a video we can play and seek into without needing to pause playback to download more data. Previously you could only get the byte position the download had reached, which often doesn’t map to the time ranges which are playable very well, especially in a variable bit rate video. This also can’t tell you if there are chunks which we skipped downloading before the downloaded byte position. Once the video controls UI is updated, users will be able to know exactly which segments of their video are downloaded and playable and can be seeked into without pausing playback to download more data. To see this in action, download a current Firefox nightly build , and point your browser at my video ‘buffered’ property demo. You’ll see something like the screenshot below, including an extra progress bar (implemented using canvas) showing the time ranges which are buffered. I’ve implemented the ‘buffered’ property for the Ogg and WAV backends. Support for the ‘buffered’ property for WebM is being worked on by Matthew Gregan, and is well underway. At the moment we return empty ranges for the ‘buffered’ property on video elements playing WebM and raw video. My checkin just missed the cutoff for Firefox 4 Beta 3, so the first beta release that the video ‘buffered’ property will appear in is Firefox 4 Beta 4. And, to shorten the definition, we just call it Linux. While I think we should give the Linux developers credit, if we wish to shorten the name, it would accurately be shortened to “GNU”. What a dork. It’s like being pissed because someone calls Windows instead of “Microsoft Windows”. Everyone knows it’s GNU/Linux but who cares. And besides we couldn’t call it GNU for short, BSD also uses GNU and there is no way to tell what we are refering to. Well this argument has no weight since in fact you are talking about a product made by the same company, GNU+Linux is in fact that GNU plus Linux, it is two very different things made by two very different projects that happened to work together very well. Lets give credit where credit is due. So the example would be like a “strawberry swirl cheese cake”, it would be insufficient to call it just “strawberry cake” or “cheesecake” it could only be called by what it is. The feature implemented is great! Way better than flash videos. I suggest you read it all as I have a feeling you may have some other misconceptions on which you then base your arguments. Calling Microsoft Windows, Windows is less explicit but still accurate. It’s simply a shorter name. 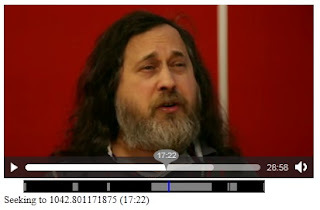 Calling GNU/Linux, Linux isn’t less explicit, it’s misleading. I fully support and agree with Tsiolovsky’s reply to your comment and would add that to ignore the work done by those who gave us the GNU project and who have striven so long and so diligently to preserve and protect those freedoms mentioned in the link Tsiolovsky gave you by terming them “dorks” or any other insult at all risks losing those freedoms. If all it takes for you to support and acknowledge the work done on behalf of those who use GNU/Linux and to do your bit to keep and protect those freedoms mentioned in the link is to call thees products by their correct names it’s little enough to ask. @Guido – you are incorrect that everyone is aware that, when the term “Linux” is used in context of an entire operating system, that it implies “GNU/Linux”. In fact, the majority of casual (generally non-technical) GNU/Linux users I have spoken with are hardly aware of GNU. Not only does using the term GNU/Linux bring attention to the fact that they are using the GNU operating system and the freedoms that it provides, it also serves as a correction. Calling “Microsoft Windows” by the name “Windows” is correct – Microsoft is the company. Their product is in fact called “Windows”. However, GNU has no connection with Linux other than the fact that Linux is bundled with GNU in order to form a complete operating system. GNU isn’t the company behind Linux, so leaving GNU out of the equation doesn’t shorten it. It’s simply incorrect. Using the term GNU/Linux both gives credit to all the individuals who have fought so hard and put so much time into developing a free (as in freedom) operating system. That aside, calling someone a dork for protecting your freedoms is rather insulting, especially if you yourself are a GNU/Linux user (I’m not saying that you are or not). Especially when referring to the person who both started and devoted his life to the free software movement. All that said, I do understand why people use the term “Linux” when speaking aloud about the GNU/Linux operating system. It’s a mouthful and it is indeed much easier to simply say “Linux”. Everyone finds ways to shorten things. I make an attempt to say GNU/Linux wherever possible, though I do slip at times as well. It’s important to keep in mind that when shortening a term, that it should still convey the same meaning. However, there’s really no reason when writing an article or typing not to use the term GNU/Linux. I think its better for free software supporters to call GNU/Linux than Linux. If there was just Linux, it wouldn’t have been what it is now. Its because of GNU’s effort that Linux is more palatable. I would prefer to call GNU/Linux. Interesting discussion, albeit off-topic. I personally support calling it “GNU/Linux”. The reference to “Microsoft Windows vs Windows” is not accurate. More accurate would be a comparison between a (peanut-butter && jelly sandwich) and a (peanut-butter sandwich || jelly sandwich). With a PB&J, you can’t just call it a peanut-butter sandwich or a jelly sandwich; it’s gotta be “peanut butter and jelly”, else it doesn’t reflect reality. It even has an Asian ring, to match people’s trendy tatoos. In 5 years’ time, when I hear the term “GinLinG” I’ll remember this post. WTF guys!?! I didn’t even mention “Linux” in my post! Any more comments in response to the “Linux vs GNU/Linux” debate will be deleted. It would be great to see this buffering for the audio tag too. Maybe it’s there by now. I’m using chrome with mp3 audio, and it doesn’t seem to skip downloading parts it doesn’t need. It would be good if it did byte range requests for the parts that have been seeked to. I will have to get some audio oggs to try out in Firefox. Great work Chris, keep it up.